The median age of Californians has increased steadily over the past decade, as has the rate of high school and college graduation. 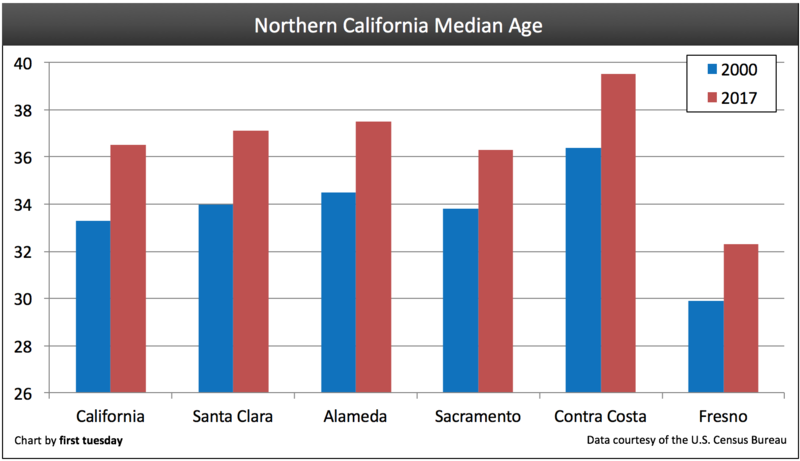 The median age of all major counties increased over the previous year in 2017 — except Contra Costa County, which saw no change in median age. 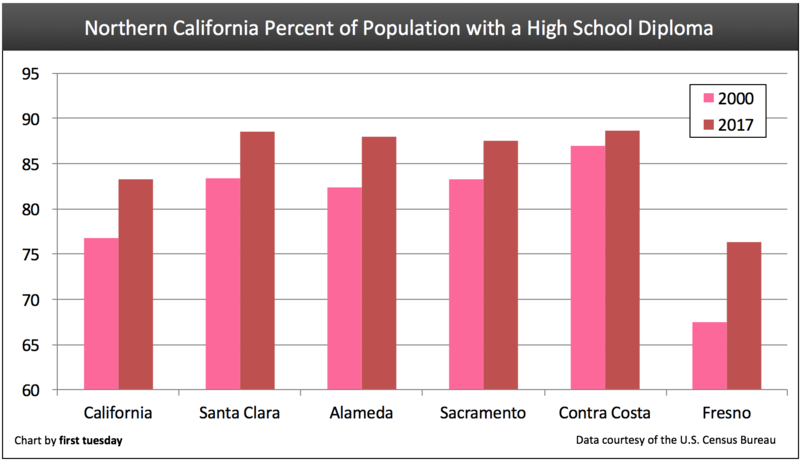 High school and college graduation rates grew most in Riverside, Alameda and Fresno, while declining slightly in Contra Costa. These factors fluctuate on a yearly basis according to local economic and demographic trends, with changes being more pronounced in younger, less wealthy counties of the Inland Empire and Central Valley and subtler in wealthier, older coastal counties. As California’s larger demographic profile changes to primarily older, more educated residents, agents must prepare to adjust their practice to cater to these groups. Post updated October 1, 2018. 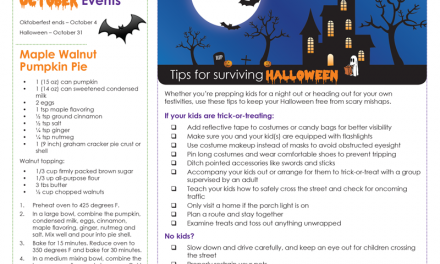 Original copy posted October 2011. This is the second article in a series discussing demographic trends statewide. For more information and demographic analysis about California’s major counties, including specific charts of income by county, see The distribution of California’s human resources. The above charts track age and education levels at the start of the last two decades for the five largest counties in Southern California (SoCal) and Northern California (NorCal), as well as the state as a whole. Together, these charts present the ten most populated counties statewide. Homebuyers may purchase a house at any time throughout their lives, but certain age groups are more likely than others to buy and sell their homes. Historically, agents can count on young adults aged 25-34, the primary demographic of first-time homebuyers, to become dissatisfied with renting and, with little encouragement, purchase their first small single family residence (SFR). On the opposite end of the spectrum, the newly-retired can be depended on to sell their oversized homes and buy a replacement home in new locations, often along the coast, to enjoy better weather, closer proximity to their professionally-employed Generation Y (Gen Y) children, and access to cultural, hospitality and medical centers. Will first-time homebuyers save California’s homeownership rate? While there is no hard distinction between “youthful” and “elderly” communities in California, some useful generalizations can be made. As the charts demonstrate, median age is rising throughout California. The median age today is over two years older than it was in 2000. Some communities have grown more exclusive and less appealing to young career-seekers, such as Orange County, and thus have aged much faster than others. Others, especially the counties of NorCal, have aged hardly at all but remain older on average, probably due to high housing prices, a mature and specialized workforce and lower immigration numbers (the Center for Immigration Studies reports that the average Mexican immigrant is 30 years old). The most dramatic changes have taken place throughout Southern California, where Los Angeles and especially Orange County both aged faster than the state average. This may be due largely to the boom in housing prices, which drove out less established young homebuyers while drawing successful older citizens with the accumulated wealth to buy a home. As prices drop and some of the youth are able to return, the recent age rise may well level out. San Diego was also influenced by this boom, but aged slightly less, perhaps due to its many universities, its proximity to the border (and thus to generally younger immigrants) and its association with the military. In the meantime, the young population has concentrated itself in California’s Inland Empire, where low cost-housing was accessible within driving distance of major cities and the careers they offer. 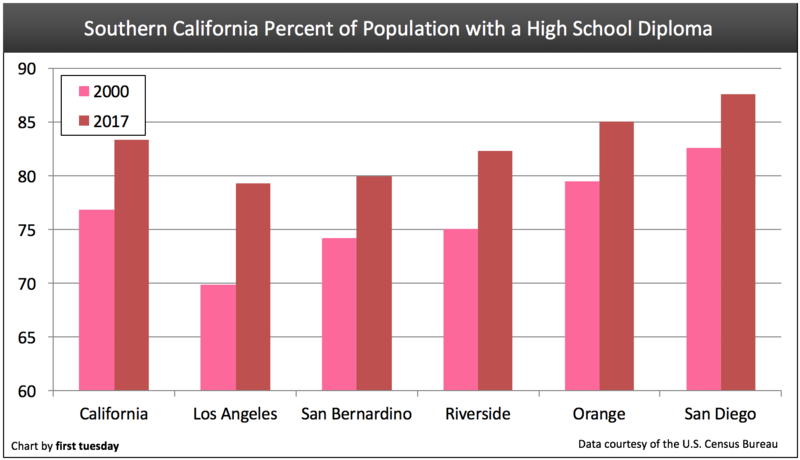 Not incidentally, Riverside’s population grew faster over the last ten years than any of the other counties listed, gaining 644,000+ people – a 42% increase in size – in the first decade of the 2000s. 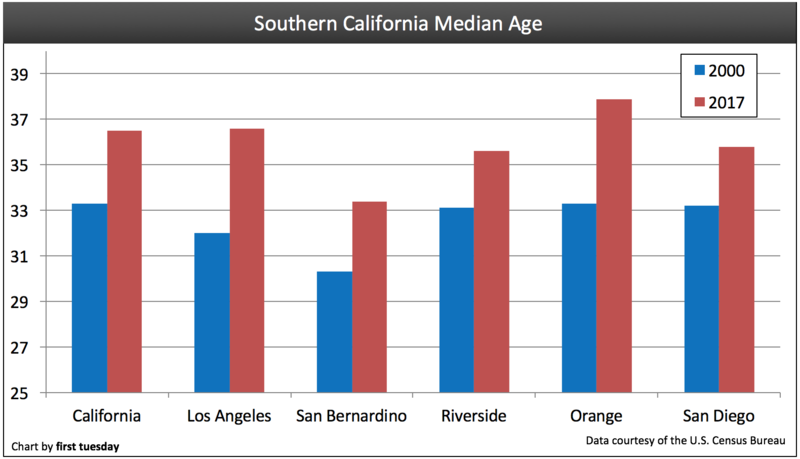 San Bernardino followed suit, growing by 19% while the median age grew by only seven months. Population growth in these inland counties was also fueled by international immigration from Mexico adding to the population of homeowners and renters, which has a much less direct effect on most of Northern California. The counties of Northern California have aged more uniformly, generally keeping pace with the state as a whole. Orange County residents who want a glimpse of their future should have a look at Alameda, Santa Clara and Contra Costa counties, which retain the highest median ages in the state. Accompanying this population are high home values, strong employment in careers that cater to the elderly (especially in the field of medicine) and a low number of rentals. An aging population means a different kind of home sales activity. Retirees very frequently remove their wealth from the stock market, called dis-saving, and relocate to a smaller, more comfortable home upon their retirement. This home may be in a different part of the state, but approximately 40% tend to find a more convenient and central location within their own community. Brokers in Orange County and most of NorCal should work to prepare for these buyers and sellers looking to enjoy their golden years. first tuesday projects members of the Baby Boomer generation will begin to retire en masse in 2018-2020. NorCal’s exceptions, again, were the less wealthy Central Valley counties of Sacramento and Fresno, where low home prices and available jobs in untrained positions (especially agriculture jobs in Fresno) served to keep the population young. The population in these counties, like that of Riverside and San Bernardino, lacked the accumulated wealth and home equity necessary to remain homeowners on a broad scale during the 2008 recession, even as an economically debilitating number of jobs were lost statewide. Those who bought or refinanced homes during 2001-2007 are now the occupants of underwater homes, owing more in debt than their homes are worth. Many will return to rentals or move to new locations (typically staying within the state) unlike the years following the early ‘90s recession. More highly-educated populations tend to seek out higher-paying white-collar jobs, which are most available in higher-density population centers, i.e. cities. They also have a tendency to be more liberal in their civic concerns and more conscious of personal consumption and environmental issues, both of which are dispositions best satisfied by buying or renting in California’s urban centers. the general access to personal and business amenities. Not surprisingly, each of these counties has a relatively old population compared to the state average: the median age is 46 in Marin and 39 in San Francisco and San Mateo (the median age for California is 36). These well-educated, well-employed and generally more wealthy communities are among California’s most exclusive, and they are dominated by those who have used their education over a long period of time to work their way toward the top of their occupations. On the opposite side of the spectrum are the state’s least educated counties, in which a high proportion of the population has neither a four-year college degree nor a high school diploma. Although education reform in the last two decades has made great strides in high school retention rates, numerous students still fail to complete high school in these counties. The communities in which they live, and the real estate they occupy, are far different from the well-educated coastal cities, something for an agent to consider if choosing to relocate. The state’s least educated counties (by high school graduation rate) include Merced and Imperial (68%) and Tulare (67%), though Fresno is not far ahead, with a high school graduation rate just under 75%. The median age in Imperial County is 32 years old; it is 30 in Merced and Tulare. While the more established older residents of San Francisco and Marin are likely to be interested in traditional SFR ownership, younger and less educated homeowners tend to be more susceptible to unemployment and foreclosure and thus have no choice but to rent. Rentals: the future of real estate in CA? In times of economic stagnation like the present, renters by choice are augmented by renters by necessity; those for whom traditional SFR ownership is no longer an economically feasible option. Keep in mind that even in the ongoing financial recovery, mortgage financing is not so rare as many news reports indicate. Brokers and agents who take the extra step of getting a wavering homebuyer pre-approved by a lender or two may give their client the extra boost of confidence needed to jump into ownership. 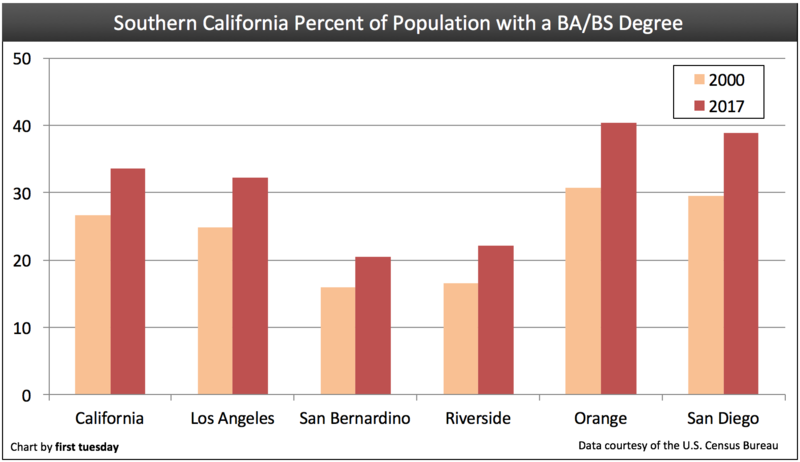 With the charts and data presented above, you might be tempted to make useless generalizations about California areas. Remember, there are young people in Contra Costa and Alameda counties, wealthy people in Fresno and San Bernardino, and extremely well-educated people in the Inland Empire and Los Angeles. Nonetheless, agents with a broad base of clients are those who most need to be familiar with the demands of tenants and buyers in their specific county. Likewise, the charts above indicate some clear winners and losers in the competition to develop a stable and potentially productive population. 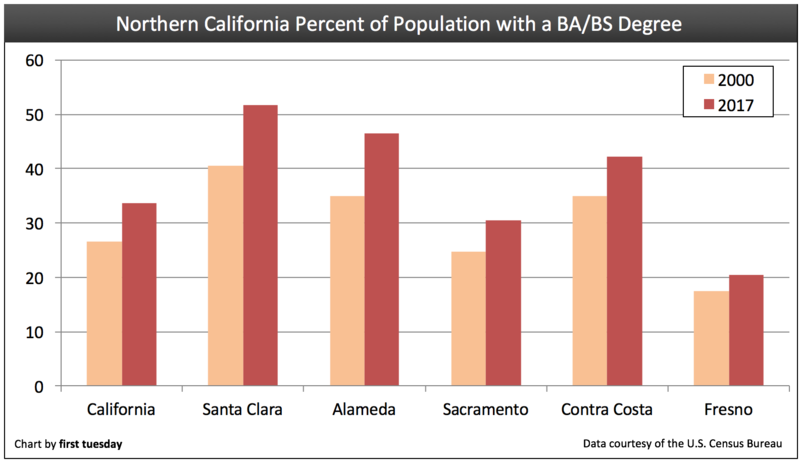 Contra Costa, especially, is among the nation’s best-educated and wealthiest populations, a fact reflected in its 65% rate of homeownership (contrast with California’s homeownership rate of under 54%). Santa Clara also seems to have found a working formula for success. These counties can only be expected to do well in the future, thanks to the support of the aging Boomer population and its accumulated wealth. In contrast, Riverside, San Bernardino, and Fresno have remained unable to support widespread employment, education or housing, with the homeownership rate in Fresno at only 52%; below both the state average and the 66% ownership rate of Contra Costa. This lack of stability is rooted in a lack of reliable income, which has only grown worse in recent years. Until full employment returns to California, the central valley (especially Fresno) and the Inland Empire will remain troubled by what are likely the worst homebuying environments in the state. The only ones who will be happy will be the speculators who hope to capitalize on relatively low home prices. Full recovery for these inland valleys will be difficult, and may require a fundamental restructuring of the housing expectations of residents. The high-priced suburban model has proven, at least in these counties, to be an unsustainable and dangerous way to build a community. Of more concern for brokers and agents looking forward are those hundreds of thousands of homeowners who have been once burned by foreclosure or short sale in the housing market, as they will think twice before deciding to buy again. Expect a rise in demand and construction of residential rental properties (though not in the periphery counties) and increased urbanization and centralization of populations over the remainder of this decade. PreviousMortgage Concepts: Is my loan subject to RESPA? 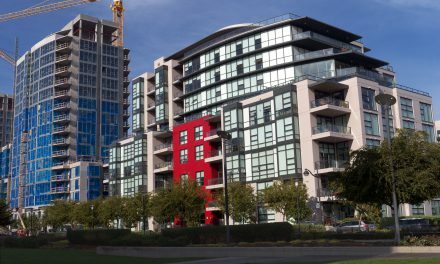 NextPOLL: Do tariffs drive up the cost of housing?